MOM! Look what I found outside! See, isn't he the cutest? Can I keep him, PLEASE?" So we come to this witty, heartwarming book with a modicum of experience. And we can appreciate Mom's concern when Lucy brings home a boy and a pitiable plea to keep him as a pet. Mom agrees with one condition...you know what that is! Both Lucy and Squeaker are delighted, and they spend the day doing everything together. Eating, napping and playing goes well. Toilet training is another story; and when Squeaker becomes his rambunctious self, everyone feels a wee bit of concern. His disappearance amps up that concern; Lucy is distraught. Catching a whiff of her new pet, she follows her nose and finds him back with his family. Seeing him there gives Lucy pause and much to think about as she trundles back home. In the end, she learns an important lesson: Children DO make terrible pets. "I wanted Lucy to be Bear for a few reasons; namely, I wanted her to be bigger than Squeaker so he’d feel even more like a pet, and I wanted to make a scary animal seem friendly. 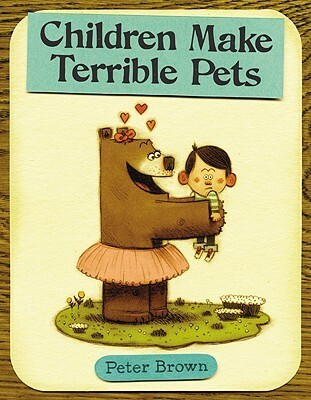 But I didn’t want kids to worry about being kidnapped by bears, so I went out of my way to make this book feel warm and friendly. I made the characters cartoony (originally they were more realistic, but it gave me nightmares, so I changed the design), I used a warm palette, and I used lots of familiar textures like construction paper and wood grain. Then, I digitally collaged together my drawings, the cut paper, and the wood grain backgrounds, and added some color. I think everything combined pretty nicely to make this a silly, fun, non-threatening story." Right he is! Don't miss the surprise ending!